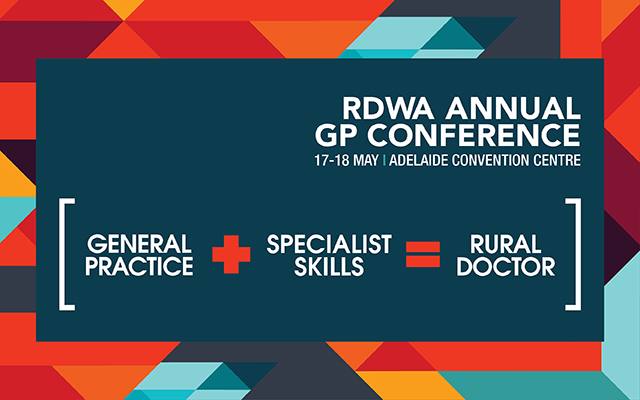 This year’s annual RDWA Rural GP conference is a program brimming with key topics for every GP working in rural SA, with a showcase line up including mental health, dermatology, pain management, child and maternal health, chronic disease management and management of emergencies in primary care. We are absolutely delighted that joint 2019 Australian of the Year, Dr Richard Harris, has accepted our invitation to talk to you on Saturday afternoon. Our two-day conference starts on the morning of Friday 17 May 2019 and will be led by a keynote from respected and long-time GP Anaesthetist Dr Peter Gilchrist who is completing his PhD research into the delivery of anaesthesia by General Practitioners. Peter has been invited to present his research at many eminent conferences and is a wonderful advocate for GP proceduralists throughout Australia. The Family Program will start on Friday after lunch, with children of all ages taking part in a fun range of arts activities. GPs and their families are invited to a casual Welcome to the Conference session from 5.30pm on Friday afternoon. Saturday kicks off with a full program that tackles Mental Health service delivery in rural SA, with an expert panel discussing case studies, and with the Family Program heading for the Zoo for a unique hands-on animal encounter. Wrapping up the conference, Dr Richard Harris, Anaesthetist, 2019 Joint Australian of the Year, medSTAR specialist and, of course, renowned architect of the Thai cave rescue, will share his experiences and there will time for you to ask him questions. We finish the two-day gathering of SA’s rural GP workforce with a casual dinner for you to share with your partners and colleagues with lively music provided by the “RockDoctors”. A grant is available to support privately arranged child care for the evening (supported by receipts); and an accommodation subsidy is available of up to $125/night for two nights' accommodation (supported by receipts). The links to view the Conference programs and to complete your Conference registration are at the top of the page. Call or email our Conference team anytime.